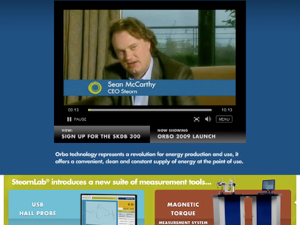 Today the Irish technology company Steorn, Ltd. announced the first in a new series of unveilings of its energy technology named “Orbo”. The announcement was preceded by the image of a curtain which rose on the new design for their Web site: www.steorn.com. Included with their new Web site are a new suite of laboratory and test equipment tools known as “SteornLab” and a passive magnetic bearings technology known as “ZeroF”. Areas of the new site also include e-learning modules (covering topics such as physics, testing and mathematics for engineers and project management), a sample e-learning module on “Key Concepts in Rotary Systems” and areas for collaboration, commercialization, SKDB environment and licenses (both commercial and non-commercial). In December of last year CEO Sean McCarthy spoke at the Dublin Institute of Technology and announced a series of upcoming talks to be held at the engineering departments of universities around the world including the Middle East, Europe and the U.S. This plan includes an invitation to 300 qualified engineers (both individual and corporate) to investigate the claims for themselves at no cost. Also new for the site and key to their road to rebuilding Steorn’s credibility is a video interview with three distinguished engineers who state that they found repeatable and measurable energy gains in support of Steorn’s claims. Since August 2006 Steorn has been at the center of a controversy surrounding their claim that Orbo’s magnetic technology can generate sustained work without the input of any other power source and without the degradation of the magnetic components. A public demonstration planned for July 4, 2007 at the Kinetica Museum in London was a disappointment when their technology failed. The exhibit was subsequently cancelled. Almost two years ago Steorn established a private forum for investigating their technology under a Non-Disclosure Agreement. Its members – physicists, mathematicians, technologists, academics, artists and interested bloggers – have operated under a strict confidentiality clause without compensation. Now it seems that hundreds of additional engineers will be joining them to view Steorn’s intellectual property under a modified General Public License and draw their own conclusions. Many members of the private forum operating under the NDA seem similarly impressed with the confidence of the interviewees. This reporter has also been operating under the Steorn NDA without compensation for over a year. Some members of that forum have agreed to give their opinions on the possible future impact of Orbo technology. Paul Story is a former RAF officer, engineer in mass spectrometry, novelist and frequent blogger regarding all-things-Steorn. Paul predicts that, “what we are seeing is the tip of an energy revolution that can quite literally take us to the stars.” Certainly the hopes surrounding Steorn’s technology run high. “I hope they become fabulously wealthy”, Story adds. Orbo will be an important breakthrough for scalable electrical power generation if the indications from the engineers featured in the video hold true during product development. It gives indications of becoming a game-changer for self-powered wearable electronics, battery-less implantable medical devices, electric vehicles and even residential power generation. Hybrid applications have especially high potential. Circuit boards for energy-demanding graphics processor chips could be self-powered. Automotive batteries could be manufactured with integrated Orbo trickle chargers to extend the range for electric vehicles and tie them to local power grids. Implantable medical generators could power pacemakers, implantable cardioverter defibrillators and TENS pain controllers for the life of a patient as well as non-implanted hearing aids, prosthetics and remote medical transmitters. If product design and development proceed rapidly and regulatory licensing is fast-tracked then the next ten years of the green power revolution may include magnetic power alongside biofuels, wind and solar.